Attention, people of Earth! Go see more movies! How are we supposed to properly mind control you if you are not in the theaters? We'll have to get more television spots for our Fanta commercials! My name is Kang, and this is my sister, Kodos. The following is our State of the Movie Industry report for September of 2005! We find it hard to believe that people of Earth have yet to realize that Reese Witherspoon swallows a bit of their souls each time they see her onscreen. She is a demon woman! And her child spawn will bring about the end of your civilization! Keep up the good work, Reese! We're rooting for you! Red Eye beat this movie out of the gate! So did The Forgotten! That doesn't matter, though, because you foolish humans are so lacking in intelligence that you will go see this unoriginal concept anyway! We really miss the gremlin on the plane story from the Twilight Zone! William Shatner is your most brilliant actor. Going back to the subject of demon spawn, why is it that you humans like them so much? This movie will just be more evidence to support that thesis! Note to Earth creatures: when the girl appears to be speaking in tongues, she is actually giving you all a very special message from our planet! It's a long distance dedication! Remember keyhole cam? That will not be back in this sequel to a movie that not very many people saw in the first place! But how do you like the alien, gun-toting woman in the film? She is heroin chic hot! Not many people will see this movie, but that doesn't mean that Jason Statham isn't the apotheosis of cool! Remember back when Nicolas Cage was "stoner dude" in Fast Times at Ridgemont High? Those are the kind of roles he should have continued to get until the end of time! He was a great stoner dude! His hairpiece hails from our planet, by the way! Hello, Kijar! We are giving a shout out to you! Keep taking good care of Nic Cage's brain! 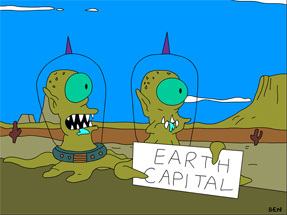 Kodos and I are currently considering how to deal with incompetent Fox executives. As long as they keep letting us on TV, we're conflicted! We love for you to see us! We also love to watch Joss Whedon shows! And Brisco County! And Undeclared! And Titus! And Action! And The Tick! And John Doe! Yes, the decision is made. We are nuking the Fox executive office from orbit! You know what's thrilling? A movie about gol...zzzzzzzzzzzzzzzzzzzzzzzzzzzzzzzzzzzzz. You got Eugene Levy straight trippin', boo! Why do you people go to movies like this? We swear to you that it will not be the next Rush Hour! Samuel L. Jackson will take any acting job for money! We'll buy this one for $1.00! Jessica Alba is pretty! Paul Walker is pretty! We hope sharks eat both of them! Remember the days when roller disco was cool? Neither do we! We still wish you would see this movie instead of The Man!